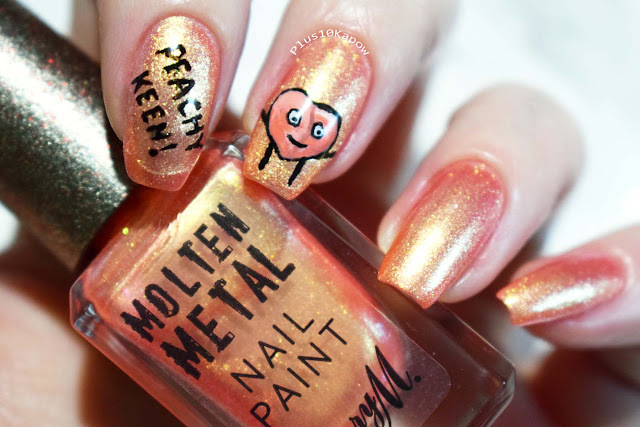 When Barry M sent over the gorgeous new Molten Metal Nail Paints, they asked if I could do some nail art to go along with them. This time, rather than trying to get multiple of the 4 polishes into one mani, I decided that they were too pretty for that and concentrated on them as the base with corresponding nail art over them. I did 5 manis and this is the first one. With the stunning Peachy Feels as the base, the first thing that popped into my head was "Peachy Keen!". 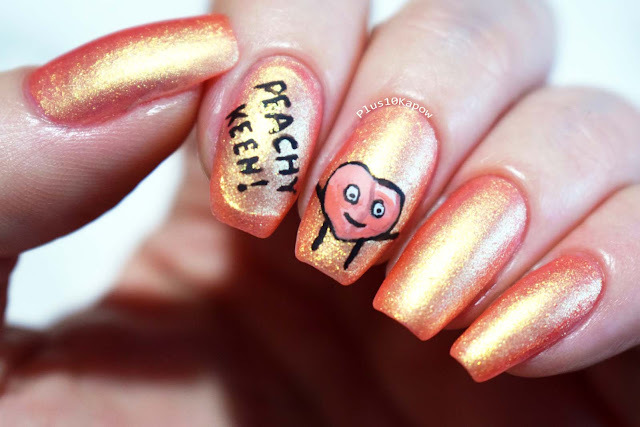 I went for writing the words Peachy Keen on my index nail and honestly, I think I am making great progress with my tiny, freehand writing, I was quite impressed with it. The N is a bit so-so but we'll ignore that. As you can see, I made it into a decal but failed to apply and melt it properly so it showed up really badly after the topcoat was applied, but it's ok, everything else was good so it's all peachy keen, hahaha. 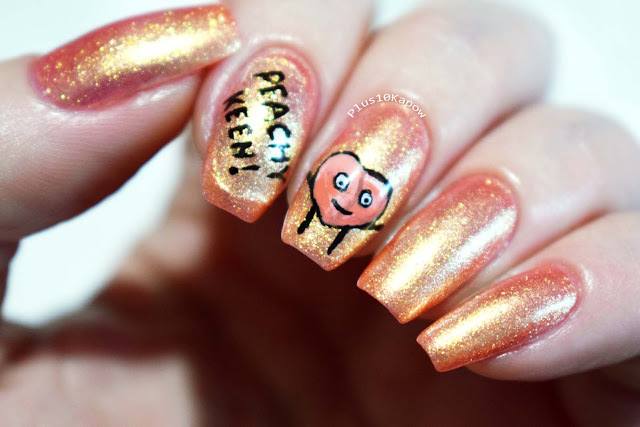 Anyway, the next thing was to also freehand a keen peach. Rather than Google pictures of peaches, I just went with what I could remember and all I could think was that they looked like butts and hearts. Obviously I had to go with a heart shape, as much as I like butts and stuff. When I filled it in, I went with a few different shades of peach/coral from previous Barry m collections. 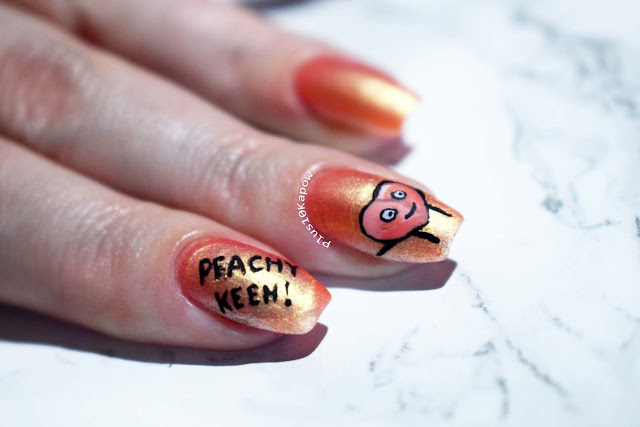 I think he looks adorable and as far as fruit based, freehand nail art, he's not half bad! I hadn't tried yet, but I needed to see how the stunning Peachy Feels looked matte, so I added a coat of Barry M Matte Topcoat and ermagherd! I think I love it even more now. Don't forget that I have a Twitter giveaway running right now, that ends tomorrow (January 30th) at 12PM, where you could win all 4 of the new Barry M Molten Metals. Pop over, RT&Follow to enter and cross your fingers and toes! These polishes release in Superdrug store on January 31st and are currently available to buy over on BarryM.com.